The "CHARMING 2 BEDROOM apartment" is situated in the most exclusive area of Ibiza Town: in Marina Botafoch, on Paseo Maritimo (Passeig Joan Carles I), a fantastic and safe location by the sea with everything close by, but at the same time it's also a quiet area: Talamanca Beach, super markets, shops, great restaurants (such as Cipriani, Heart, Sushi Point, Trattoria de Mar), cafès, Ibiza Gran Hotel Spa and Casino, Pacha Club and Lio, are all within short walking distance but far enough not to hear the noise. And it's only about 15 minutes walking to Ibiza Old Town and Dalt Vila (or 2 minutes by taxi, ferry or car). The taxi rank is on the next block. Also the ferry dock is only 5 minutes walking. The fully furnished apartment is composed of: 2 double bedrooms - one of them ensuite - (on request, beds can be made twins, instead of double, in one of the bedrooms), 2 bathrooms (one with bathtub and the other with shower) , a large living/dining room with a comfortable sofabed for 2 people, an open and fully equipped kitchen, and a terrace with partial/side view on Ibiza Old Town equipped with table and chairs where you can enjoy your meals "al fresco" and relax. Air conditioning, free Wifi, Flat TV, stereo Hi-Fi, , I Pod player, safe, washing-machine, clothes dryer, dishwasher, Nespresso and regular Coffee machine, microwave, toaster, blender, kettle, hair dryer and 2 communal swimming pools. The apartment is only a 10-15 min taxi ride from the airport and as everything is close by (including a taxi stand) , no car hire is necessary. However, if you plan to hire a car, FREE OF CHARGE PARKING SPACES ARE ON THE STREET near the Building or, if you prefer, you may rent a parking space in the garage of the complex, on request. Please, kindly note that our apartment has VERY COMPETITIVE PRICES compared to similar apartments in the same area or complex, which are rented per day, since our minimum stay is 30 nights. PLEASE, CONTACT US FOR ANY INFORMATION YOU MAY NEED. PLEASE, CHECK ALSO OUR PROPERTY 837632.This apartment is rented in accordance with the Spanish Law called "LAU" and no hotel/tourist services, such as breakfast or daily housekeeping, are offered. Nespresso Coffee Machine and Regular coffee machine; Coffee Caps provded for the 1st day. This apartment is beautiful and well kept and maintained properly. Really well equipped with everything you might need and more. We stayed in here for 1 month. The location is stunning, whether your interest is the beach, restaurants, sightseeing or people watching. You can walk anywhere. The apartment managers were very welcoming and helpful. I'd stay here again in a heartbeat, and recommend the apartment to all my friends! Das Apartment liegt sehr nahe der Marina Botafoch. Lio, Heart, Keeper, STK, It, Pacha, die Marina und der Strand von Talamanca sind jeweils in nur 5 Minuten zu Fuß erreichbar. Hinter dem Gebäude gibt es ein Stück Brachland, dass als Parkplatz genutzt wird (wenige Schritte bis zur Haustür). Die Wohnung ist für eine Ferienwohnung sehr gut geschnitten und gut ausgestattet. Die Möbel sind wie bei vielen Ferienwohnungen zwar auf den ersten Blick optisch OK aber teilweise etwas abgenutzt und nicht sehr hochwertig. Zwei Schlafzimmer (Doppel oder Twin möglich) (ca. je 10 qm) mit zwei Bädern (je 5 qm) werden über einen langen Flur (ca. 10 qm) mit dem Wohn/Esszimmer/Küche (ca. 30 qm) und dem Balkon (ca. 10 qm) mit Blick zur Altstadt verbunden. Die Wohnung ist frei von Flug- oder Strassenlärm, allerdings sind die Wände wie oftmals in Spanien nicht gut schallisoliert. Ich hatte allerdings sehr ruhige Nachbarn. Die Schlafzimmer lassen sich vollkommen verdunkeln und daher konnte ich sehr gut und sehr ruhig (teilweise unter 30 dB!) schlafen. Einmal die Woche wurde gut gereinigt und die Bettwäsche/Handtücher ausgetauscht. Die Unterstützung durch den Eigentümer (per email/sms) und die Verwalterin Mary waren reibungslos, sehr freundlich und zuvorkommend. 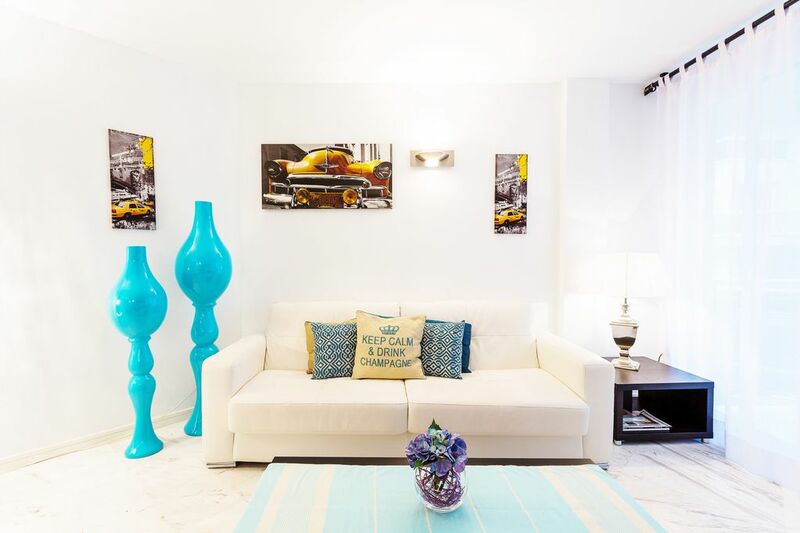 The apartment was beautiful, very clean, great facilities with comfy beds and a large balcony to enjoy the nice views to Ibiza old town. The location is excellent, a 15 minutes walk along the marina into Ibiza old town, 5 minutes from the beach, supermarkets, great restaurants etc. Perfect in any way, nice interior and super clean. Close to Talamanca beach and 15 minutes walking to center of Ibiza. Nice and friendly welcome bij hostess. Would certainly go back. Super Ausstattung, prima Lage am Yachthafen. Fantastisch apartement op prachtige locatie! Mooi, licht en ruim appartement van alle gemakken voorzien. Heerlijk balkon waar we s'morgens met 5 personen prima konden ontbijten met uitzicht op Ibiza stad. Prachtige locatie, op loopafstand van Ibiza stad, Talamanca beach en de leuke restaurantjes en winkeltjes van Marina Botafoch. Autoverhuur vlakbij en taxistandplaats ook. We hebben vijf dagen genoten van Ibiza. Gastheer Antonio zeer vriendelijk en erg behulpzaam. Echt een aanrader, we komen zeker nog eens terug! The apartment is situated in the most exclusive area of Ibiza Town: Marina Botafoch, on Paseo Maritimo (Passeig Joan Carles), a fantastic and safe location by the sea with everything close by, but at the same time it's also a quiet area: Talamanca Beach, Great restaurants (such as Cipriani, Sushi Point, Trattoria de Mar), cafès, mini & supermarkets, shops, Ibiza Gran Hotel Spa and Casino, Pacha and Lio are all within short walkable distance although no noise! Also the new faboulos marina area with the most beautiful yachts and other great bars and restaurants and luxury shops, is atonly 200 meters,. And it's only about 15 minutes walking to Ibiza Old Town and Dalt Vila (or 2 minutes by taxi, ferry or car). The taxi stand is next block. Also the ferry dock is a only 5 minutes walking. Everybody defines this area as Ibiza's Golden Mile. Undoubtedly there is not a better choice to enjoy a luxurious holidays in Ibiza. The other famous beaches: Playa d'En Bossa, Salinas (Sa Trinxa) and Es Cavallet are at only 10 or 15 minutes far by car. Whilst car hire is great to see the island, the apartment is only a 10-15 min taxi ride from the airport and as everything is close by, (including a taxi stand) no car hire is necessary. Please, kindly note that our apartment has VERY COMPETITIVE RATES compared to similar apartments in the same area or complex, which are rented per day, since our minimum stay is 30 nights and our monthly rates are MORE AFFORDABLE. Electricty, air conditioning, water, wifi internet cost and taxes are included in the rate. A refundable damage deposit will be paid upon arrival and it will be refunded on the day of departure (the exact amount between 300 and 600 depends on the length of stay).PLEASE, CONTACT US FOR A QUOTE.